I tried it on v0.9.8 and it's still got the same glitches as before, are you on android or Windows? I just tried the build you mentioned earlier and it still doesn't work on android,I guess it only works on Windows at this point. (04-07-2014 06:46 PM)QuarterRab Wrote: I just tried the build you mentioned earlier and it still doesn't work on android,I guess it only works on Windows at this point. Still no some method to work on android without framebuffer to cpu, gpu? (08-14-2014 06:28 PM)Miryo Wrote: Still no some method to work on android without framebuffer to cpu, gpu? EU is the only playable? I have the US ver. here and the char selection and in-game are messed up. I apologize for bumping this thread, but I downloaded the latest version for Windows and the game both the USA and Europe version is still missing the sprites. Is there a fix for this yet. 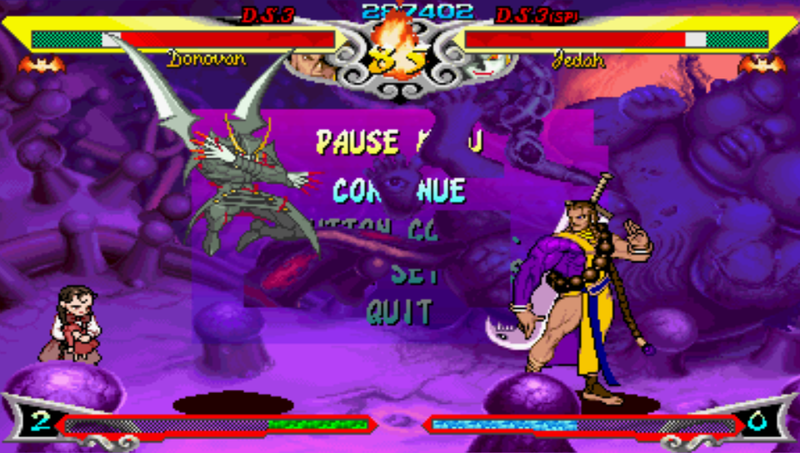 Just tried it out, same problems with invisible menu options and character select screen. I get the main menu just fine, but when I move to Arcade none of the options show. (06-01-2017 11:44 AM)AssClown_King Wrote: Just tried it out, same problems with invisible menu options and character select screen. I get the main menu just fine, but when I move to Arcade none of the options show. Yeah wonder if this will ever be updated, non-buffered or CPU/GPU rendering help I recall but might just be best to stick to the arcade ports. If fans of this game wants an update - to see this game's proper graphics the only option is and probably forever will be software rendering - which does require a powerful desktop pc and on mobile platforms was actually completely hidden not long ago. The problem is this isn't a proper PSP game, it looks like it's running inside an emulator and has as a matter of fact similar problem to menus in many psp homebrew emulators - for some graphics it's direcly writing bytes to vram which can't be detected by rendering api's. Even with hacks it's unlikely to detect that properly without making it even slower than software rendering is. Read framebuffers to memory that people use here isn't a proper solution, it just uploads everything which is not how games work and not only this causes various graphic glitches, it also tends to cause crashes so there are plans to remove it completely in the future. For reference see #6647 and #9080 which describe such problems. there has been a regression with latest (1.6) build. the game will now run only with that software option, and its very slow even on my I7 with 16 gb of ram! As I wrote in post above this is not a regression, the hackish option which was showing some things mixed with glitches wasn't displaying correct graphics in this game either, there were many reasons to remove it and just like I warned above, it finally was removed. Using software rendering was always the only way to display this game correctly and most likely as I explained in post above forever will be. Software rendering IS very demanding and playing until someone introduces some form of multithreading to it might require frameskipping even on powerful cpu's, but neither ram or "i7" has anything to do with it's performance, currently you want the latest architecture with highest clocks for a single core. (05-27-2018 01:06 AM)LunaMoo Wrote: As I wrote in post above this is not a regression, the hackish option which was showing some things mixed with glitches wasn't displaying correct graphics in this game either, there were many reasons to remove it and just like I warned above, it finally was removed. but neither ram or "i7"
yes an I7 cpu, 3.6 ghz to be more preceise. never heard of it? >currently you want the latest architecture with highest clocks for a single core.